The reader should be aware that the suggested picks may or may not be available at the team’s slotted picks at the draft. They are indicative, however, of the types of players that will be available and the types of choices that Kevin Cheveldayoff will have to make come June 30th in New Jersey. 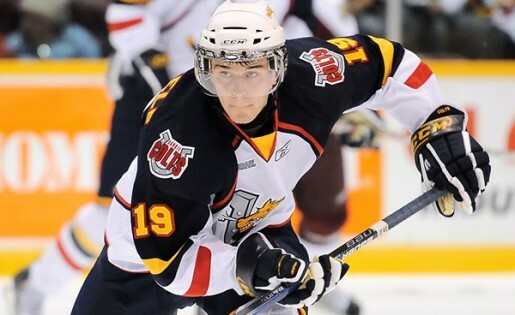 The NHL Draft is now only 16 days away, watch prospect videos and interviews on our 2013 Draft Central page! 1 – Number one centre – The Winnipeg Jets may still be in search of a number one centre. Mark Scheifele looks promising but may be better suited to the number two position or even on the wing. With Winnipeg looking like they will continue to get better, this may be a last realistic chance to nab a player through the draft with the potential to be a number one centre. 2 – Shutdown defenseman – Yes, Jacob Trouba will be there in the fall and will likely grow into one half of that shutdown pairing but a big hard to play against guy from the left side, with or without offense, would make him that much more effective. 3 – Gritty forward – A little more sandpaper up front would help to make the top forwards even more effective. 4 – Best player available (BPA) – Best player available is always a good draft strategy. However, when there are many players of similar value, it is usually the one who has the qualities your team values the most that comes out on top. Potentially available at 9 ending at 19 are: Nikita Zadorov, Darnell Nurse, Max Domi, Bo Horvat, Alexander Wennberg, Frederik Gauthier, Hunter Shinkaruk, Josh Morrissey, Samuel Morin, Ryan Pulock and Curtis Lazar. Winnipeg is getting better; Mark Scheifele and Jacob Trouba likely will be on the big club come fall. Maybe the problem that has plagued Winnipeg/Atlanta for some time (lack of a big time go to centre) has been solved. However, there are some interesting centres who may be still available when Winnipeg picks at number thirteen who can be argued to be the best player available as well. Max Domi has potential as a number one centre and Bo Horvat is just as good as a winger as well. Alexander Wennberg can also play wing but it is Frederick Gauthier who is the most interesting story of the lot. Written off as a big, defense at all costs, no offense centre a la Radek Bonk by some, he is a potential Jordan Staal by others. He was instrumental in helping Canada win the gold medal at the U18’s – their best player when it counted, the semis and the gold medal game. Curtis Lazar, the right handed and western version of Bo Horvat, may also be available – he is ranked very high by some clubs. Potential picks in the 39 to 49 range are: William Carrier, Artturi Lehkonen, Michael McCarron, Jimmy Lodge, Dillon Heatherington, Anthony Duclair, Eric Comrie, Nic Petan, Nick Baptiste, Tristan Jarry, and Tommy Vanelli. Also potentially available is Marko Dano, definitely a BPA type (best pest available). There will be some good players still available at 43 who could potentially play top four D, top six forward or be a difference maker type on line three. My favourite in the group would be Dillon Heatherington, a large (6’4) difficult to play against defenseman who skates well and still needs to fill out. Also, another favourite of mine is William Carrier, a player destined to be picked in round one until he was injured and missed half the season. Micheal McCarronis listed, but most seem to think he will go much higher than my rating. An interesting choice also would be Mark Dano, a BPA (best pest available) type playing in the KHL who wowed everyone with his play at the U20’s. He could also be available at 59 but most likely he will be gone by then. Potentially available starting at 55 and ending at 67 are: Jordan Subban, John Hayden, Hudson Fasching, Connor Hurley, Spencer Martin, Brent Pesce, Philip Desrosiers, Eric Roy, Linus Arnesson, Nick Sorensen, Oliver Bjorkstand, Michael Downing, LucasWallmark. The second ranked goalie, Eric Comrie is also a possibility. Here, I eliminated the goalies and smallish players and went with the BPA left. I did not choose Hudson Fasching who may have the biggest upside of the group because of his inconsistency, but teams may fall in love with his potential and character. Potentially available starting at 70 and ending at 80 are: Gustav Olofsson, Yan Pavel Laplante, Mitchell Wheaton, Emile Poirier, Myles Bell, Matt Buckles, Marc-Olivier Roy, Ryan Fitzgerald, BogdanYakimov, Keaton Thompson and MacKenzie Weegar. The surest and best bet in this group is Gustav Olofsson, a smooth skating 6’2 defender out of Sweden who plays in the USHL. He is not a hitter but provides a calm reassuring presence on the backend. After Gustav, it gets more interesting but much less predictable. Myles Bell put up some big numbers for the Kamloops Blazers after being converted to forward from defense this year. You may recall he was supposed to be drafted in the second round in 2011 until he was involved in a car accident which had a fatality. Then there is Matt Buckles, a 6’2, 210 lb. centre, who loves to play the big man game and drives to the net. If you think that you can improve this guy’s skating just a little, you could hit a home run. Lastly, you may wish to think about Keaton Thompson, a player many had in the first round (including me) for much of the season. However, towards the end of the season, Keaton lost his composure and confidence and was just abysmal at the U18’s. If you can help him find his mojo, maybe you still have that first round talent – just a consideration. By the way, I have not included Emile Poirier as most have him ranked to go much earlier than I do. Potentially available starting at 87 and ending at 97 are: Gabryel Paquin-Boudreau, Vincent Dunn, Juuso Ikonen, Matt Murphy, Peter Cehlárik, Carl Dahlström, Teemu Kivilhalme, Juuse Saros, Jackson Houck, Niklas Hansson and Peter Trainor. You got to love a draft when you still can get excited over the player you could select at 91. This is such a draft. Peter Cehlárik, Gabryel Paquin-Boudreau and Carl Dahlström are all players who could have top six forward or top four D futures. Potentially available starting at 100 and ending at 110 are:Will Butcher,Mason Geertsen, Emile Djuse, Anthony Florentino, Gage Ausmus, Viktor ArvidssonGreg Chase, Dylan Labbé, Jérémy Grégoire, Jesse Lees and RemiElie. Remi Elie may have only third or fourth line potential but he provides that big-time spark that all clubs love and winning clubs usually have. Mason Geertsen is a longshot but he provides some of the best truculence and big-man belligerence in this draft. Also there is Gage Ausmus, a stay at home defenseman for the USA U18 team, who has good size and provides enough physicality to make him a consideration. Potentially available starting at 130 and ending at 140 are: Jarred Hauf, Jeff Corbett, Connor Rankin, Cole Cassels, Connor Rankin, Stephen Harper, Luke Johnson, Dakota Mermis, Evan Allen, JooseAntonen, Zach Glienke, Evan Cowley, Antoine Bibeau or Scott Oke. OK, there are no superstars or potential superstars in this group but there is enough promise that you can at least hope that one turns into an NHL player. Heading the list would be a 6’5 hard to play against defenseman from Seattle named Jarred Hauf. Connor Rankin who also plays in the US portion of the WHL had a reasonable season with 58 points in 72 games. Finally, there is another personal favourite of mine in Scott Oke, a 6’3 right winger who skates well and can put up a few points. The Winnipeg prospect goalie ranks are an intriguing group; a goalie may still garner consideration at this point. Brendan Burke, Marcus Högberg, Evan Cowley and Antoine Bibeau could be available and also have potential. Fifth round picks generally are only about 11% successful, so good luck. It is virtually impossible to tell who might be available from 164 on so what I did was list those personnel who I have ranked in the 3rd and 4th rounds and the 5th round up to 145 which the NHL has ranked 164 or greater that still have a decent chance of still being available. As this is as good time as any to make sure you take the best player available, I have listed the prospects in ranking order. 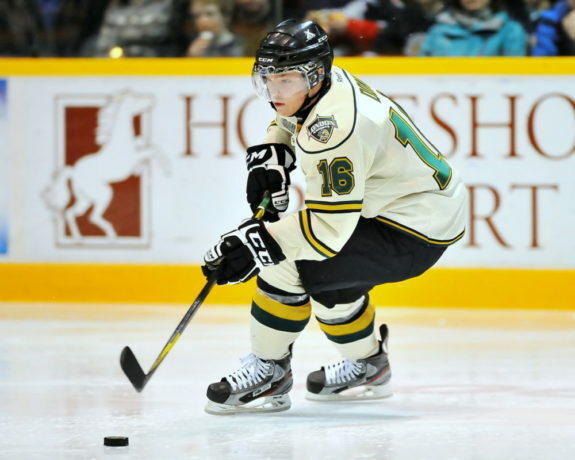 I have also added Albert Yarullin who has a big shot on the power play, Mitchell Theoret (6’2, 212) who looked very good for Barrie in the OHL playoffs and Brenden Kichton, a power-play quarterback with Spokane. *Take one last look at the above roster before the craziness of summer begins – Snapshot from June 25, 2013. 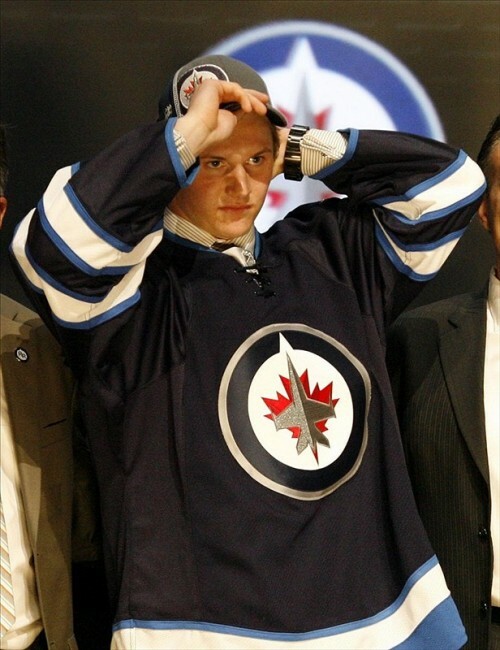 Note: I have left Jacob Trouba as a prospect since he didn’t play any games for the Jets in 12-13. I am sure he will be in the line-up for 13-14. Editor’s Commentary (Chris): RW Scott Kosmachuk, the Jets 3rd round steal from 2012) would have my top 10 prospects for the Jets, possibly even top 5. Eddie Pasquale shold probably be in the mix as well. Goalie Connor Hellebuyck has also raised his stock. Jets' prospect Brennan Serville had an injury-filled sophomore year with the U of Michigan Wolverines.